Posted February 24, 2015 . For mobile, Ionic has got you covered with its ion-list. However currently (version 1.3.8), a CollectionView in Ionic, that should look and work like iOS’ UICollectionView, has not been implemented. The Ionic directive collection-repeat enables you to turn ion-list into a grid using collection-item-width and collection-item-height, but it’s still buggy. Worst of all, I can’t get the layout I want for bigger screens, but I found a simple workaround. ]1 CollectionView having one item in a row. ]2 CollectionView having two items in a row. 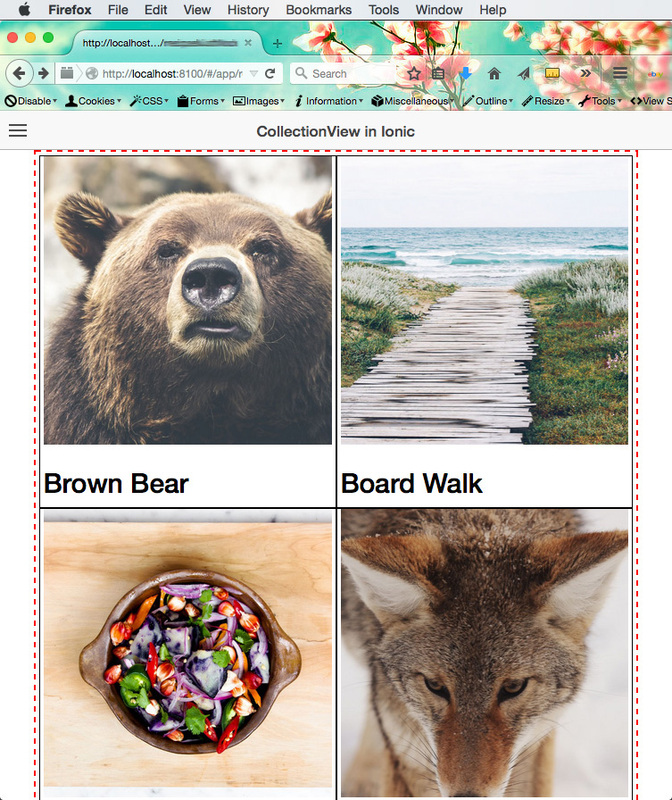 ]3 CollectionView in Ionic having three items in a row. We won’t be using ion-list (sadly). But that’s okay, because ion-list is just a directive. We’ll be making a grid. On mobile screens, each item will be stacked together. Then we’ll use media queries to changed the layout. Use $scope to put the data from MockDataFactory to the view. This markup displays the image and the name from the MockDataFactory. The image and the name are grouped in collection-item class. The collection-item is what we’ll modify to change the number of items in a row. Now for the CSS. Let’s start with mobile-first. In the above code, I’m defining the collection-container class so that it’s centered with a maximum width of 1120px. I don’t want it to be bigger than that. I’ve included a border. It’s for debugging purposes and you may exclude it. For mini-tablets, I want 2 items in a row. To achieve this, collection-item class is updated to have width of 50% and inline-block display. For bigger screens like the regular (original) iPad and wider Android tablets, I want 3 in a row. It really depended on the CSS. I didn’t use any grid frameworks to avoid bloat. I didn’t use the Ionic grid either because it didn’t give me what I wanted. If you want to design for bigger screens like TV’s, use a bigger maximum width and have more items in a row. It makes me sad that I have to make a CollectionView in Ionic like this. I really want to use ion-list, but as of now, it’s just really buggy. Though in the end, everything is still HTML5 and CSS3. Some would argue that collection-repeat can handle a lot of data. Angular’s ng-repeat should be able to handle a lot of data as well. 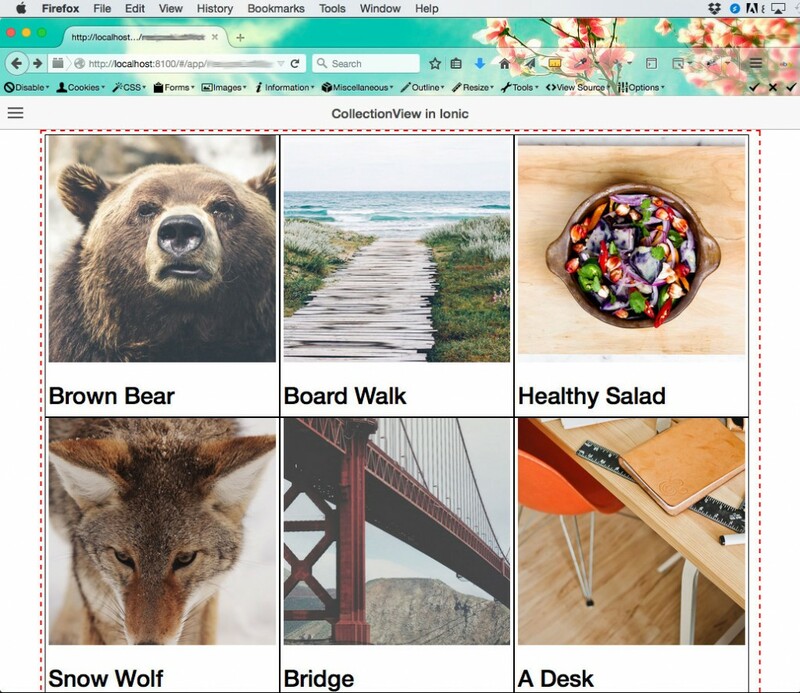 I’m still anticipating the fixes and updates for Ion-List’s collection-repeat and its grid! At least for now it works on iOS and Android. I am also working into ionic and angular, and came across your blog through ionic forums. Just wondering why there is no email subscription option on your blog so i get notified when you post something ? I wish Ionic adds some support for UIColllectionView based TILE based display. Cool. I believe css should be the complement to turn an ionic implementation more equivalent to a native implementation. About the UICollectionView… My first need is the fact my list is very big… more than 800 itens… in a native implementation swift, or also in a native android implementation with recyclerView, I can manipulate several itens without problems, and at ionic it has been a problem because it’s slow.